The number of job vacancies totalled 462,000 in the first quarter, up 75,000 (+19.3%) from the first quarter of 2017. Meanwhile, the job vacancy rate rose 0.4 percentage points to 2.9%, continuing the series of year-over-year increases in the number of vacancies and the job vacancy rate that began in the fourth quarter of 2016. Job vacancies rose across most provinces, industrial sectors and occupational groups on a year-over-year basis. The number of job vacancies in Canada (unadjusted for seasonality) was down 1.6% between the fourth quarter of 2017 and the first quarter of 2018. In comparison, the number of vacancies was little changed between the fourth quarter of 2016 and the first quarter of 2017, while job vacancies declined 7.5% between the fourth quarter of 2015 and the first quarter of 2016. Compared with the first quarter of 2017, job vacancies increased in eight provinces in the first quarter, led by Quebec and British Columbia. Increases were also observed in the territories, while the number of job vacancies was little changed in Newfoundland and Labrador and Prince Edward Island. The job vacancy rate also increased in most provinces and territories over the year. In the first quarter, the number of job vacancies was up by 25,000 in Quebec (+37.3%) compared with the same quarter in 2017. This was the seventh consecutive quarter with a year-over-year rise in the number of job vacancies in the province. Job vacancies increased in the majority of the sectors, led by manufacturing and accommodation and food services. At the same time, the job vacancy rate rose by 0.6 percentage points to 2.6%. Job vacancies and the job vacancy rate rose in most economic regions (ER) within the province, with Montréal (+8,700) having the largest increase in the number of job vacancies. Over the same period, the Labour Force Survey showed that the unemployment rate in Quebec fell from 6.3% to 5.5% between the first quarters of 2017 and 2018. Employers in British Columbia reported 24,000 (+35.7%) more job vacancies compared with the first quarter of 2017. Over the same period, the job vacancy rate rose 1.0 percentage points to 4.2%, the highest rate among the provinces, and the number of job vacancies increased in 19 of the 20 industrial sectors. Partly reflecting the large size of its labour market, growth in job vacancies was concentrated in the ER of Lower Mainland–Southwest (+17,000), which includes Vancouver. Within this ER, the largest increases in job vacancies were in sales and service occupations as well as trades, transport and equipment operators. There were 9,800 (+5.7%) more job vacancies in Ontario compared with the same quarter a year earlier. Over the same period, the job vacancy rate rose 0.1 percentage points to 2.9%. Job vacancies increased in a number of industrial sectors, led by transportation and warehousing (+4,200), health care and social assistance (+2,400) and arts, entertainment and recreation (+2,300). At the same time, job vacancies declined notably in retail trade (-7,600). The ERs of Kitchener–Waterloo–Barrie and Ottawa recorded the largest increases in vacancies, while vacancies in the ER of Toronto were little changed. Job vacancies in Alberta were up 7,900 (+18.5%) in the first quarter, led by health care and social assistance. Job vacancies were also up notably in construction; mining, quarrying, and oil and gas extraction; and administrative and support services. Between the first quarters of 2017 and 2018, the job vacancy rate in the province was up 0.4 percentage points to 2.6%, the fifth consecutive quarter with year-over-year increases in the job vacancy rate. Among the smaller provinces, Manitoba reported an increase of 2,800 (+26.4%) job vacancies in the first quarter, driven by health care and social assistance. Over the same period, the job vacancy rate was up 0.5 percentage points to 2.3%. This was the fourth consecutive quarter with year-over-year increases in job vacancies. However, according to the Survey of Employment, Payrolls and Hours (SEPH), payroll employment in Manitoba rose 1.1% between the first quarters of 2017 and 2018, a slower rate of growth than the national average of 2.2%. The number of job vacancies was up in 9 of the 10 largest industrial sectors (in terms of employment) between the first quarters of 2017 and 2018. Retail trade was the sole sector registering a decrease over the period. The number of job vacancies reported by employers in health care and social assistance was 11,000 (+27.3%) higher compared with the same quarter a year earlier. With this increase, the sector became the second largest in regards to the number of vacancies—the first being accommodation and food services; a first since the beginning of the series in 2015. In the first quarter, the job vacancy rate in health care and social assistance was up 0.5 percentage points to 2.6%. Job vacancies were up in all four subsectors, with notable rises in ambulatory health care services as well as nursing and residential care facilities. The rise in job vacancies was also broadly based across provinces. Transportation and warehousing had 9,300 (+45.6%) more job vacancies compared with the first quarter of 2017, mainly driven by Ontario and Quebec. As in the previous three quarters, this sector recorded the largest year-over-year increase in the job vacancy rate (+1.1 percentage points) among the 10 largest industrial sectors. Large increases in the number of job vacancies and the job vacancy rate were reported in truck transportation and in support activities for transportation. The rise in vacancies in transportation and warehousing was consistent with growth in national real gross domestic product recorded in this sector over the same period. Job vacancies in manufacturing rose 7,800 (+23.2%) in the first quarter, and the job vacancy rate increased from 2.2% in the first quarter of 2017 to 2.7%. On a year-over-year basis, there were notable increases in job vacancies in transportation equipment, fabricated metal product manufacturing, as well as food manufacturing. While the job vacancy rate in transportation equipment manufacturing was among the lowest across the subsectors, the rates in the latter two subsectors were among the highest. 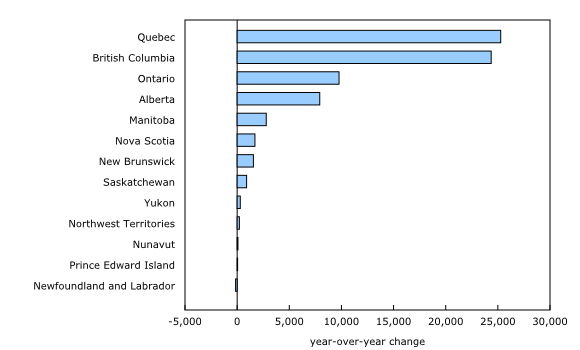 Job vacancies increased the most in Quebec and Ontario. By contrast, the number of job vacancies in retail trade declined by 6,600 (-13.3%) in the first quarter, following little change between the fourth quarters of 2016 and 2017. The job vacancy rate was down 0.3 percentage points to 2.1% in the first quarter, the lowest level for this sector since the first quarter of 2016. 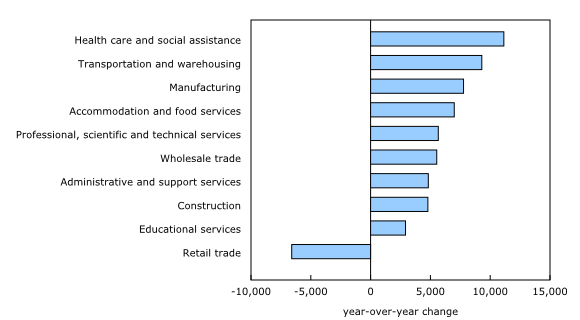 The year-over-year decline was the result of decreases in a number of subsectors. Several provinces reported declines, particularly Ontario. According to the SEPH, year-over-year growth in payroll employment in retail trade slowed to 0.2% in the first quarter. Job vacancies were up in 9 of the 10 broad occupational categories in the first quarter, with the largest increase in trades, transport and equipment operators, followed by sales and service occupations. 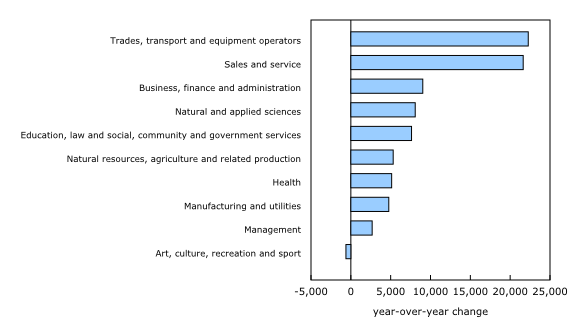 Over the same period, the number of vacancies in occupations in art, culture, recreation and sport was little changed. In the first quarter, job vacancies in trades, transport and equipment operators rose by 22,000 (+37.0%) on a year-over-year basis. Many of the more detailed occupational groups within this broad category were up, particularly motor vehicle and transit drivers (+7,900) and trades helpers and labourers (+3,300). Job vacancies in trades, transport and equipment operators were up in eight provinces, led by British Columbia and Quebec. There were 22,000 (+17.6%) more job vacancies in sales and service occupations compared with the first quarter of 2017, with the increase concentrated in British Columbia and Quebec. The rise in vacancies was consistent with increases in several related sectors in the quarter: accommodation and food services (+7,000), administrative and support services (+4,800), and arts, entertainment and recreation (+2,900). On the other hand, the decline in retail trade contributed to the dampening of the overall increase in vacancies within sales and service occupations. Within sales and service occupations, there were notable increases in vacancies in food counter attendants, kitchen helpers and related support occupations (+6,300) and customer and information services representatives (+3,600). However, cashiers had 2,100 fewer vacancies compared with a year earlier, with Ontario accounting for more than three-quarters of the net decline. For cashiers in this province, job vacancies decreased solely for part-time work. The offered wage for vacant positions in sales and service occupations was up 8.7% in the first quarter, with Ontario (+14.9%) and Alberta (+9.6%) reporting the largest percentage increases. The gains for this low-wage occupational category also coincided with a notable rise in the minimum wage in these two provinces. 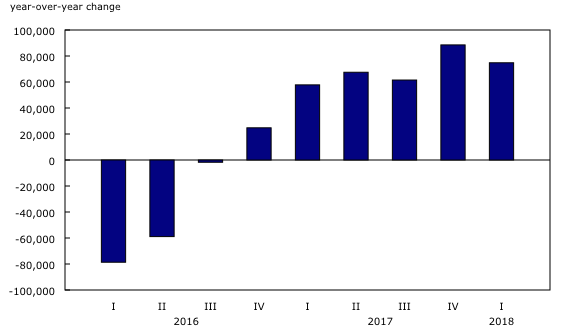 Collection of the wage component was suspended in January 2018. A study is being conducted on how to provide more detailed information by regions and occupations and collection of wage information will resume based on the results of the study. With the release of data for the second quarter of 2018, the JVWS will start using the North American Industry Classification System (NAICS) Canada 2017 Version 2.0 instead of the NAICS 2012. Data will also be revised historically back to the beginning of the series. The NAICS has 20 industrial sectors at the two-digit level in both versions of the industry classification. The target population of the survey includes all business locations in Canada, with the exclusion of those primarily involved in religious organizations and private households. While federal, provincial and territorial administrations are also excluded from the survey for now, they will be phased in later. Job vacancy data from the JVWS for the second quarter will be released on October 11. More information about the concepts and use of data from the Job Vacancy and Wage Survey is available online in an updated version of the Guide to the Job Vacancy and Wage Survey (Catalogue number75-514-G).